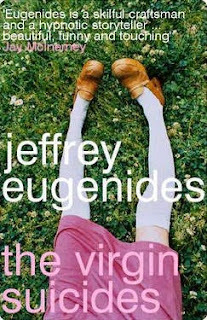 The Virgin Suicides by Jeffrey Eugenides (author of Middlesex and more recently The Marriage Plot) seems to have been around for ages, despite only being published in 1993. The novel is set in 1970s Michigan, USA and centres around the Lisbon girls, who - we learn very early on - all commit suicide. Their decline and ultimate demise is narrated in first person plural, which I found confusing in the beginning until I realised I wasn't just reading their story as witnessed by a teenage boy, but from the perspective of a group of boys. Their curiosity about the Lisbon girls fills the pages, each of them having their own story to tell about one of the sisters. This fixation develops into a morbid fascination that never really leaves the boys in their later lives. Despite the somewhat dark subject matter of teenage depression and suicide, Eugenides is somehow able to weave in plenty of humorous moments and amusing observations and his writing is a pleasure to consume. The Virgin Suicides is a haunting but rewarding read, and I would definitely consider reading more from Eugenides in the future. P.S. This is the first book I can remember being narrated in first person plural (a new term for me), do you know of any others?